First Measure the pipe clamp to see where the middle is based upon your jar size, then mark with sharpie or just remember where to drill. Using a screwdriver helps unwind the clamp. See? 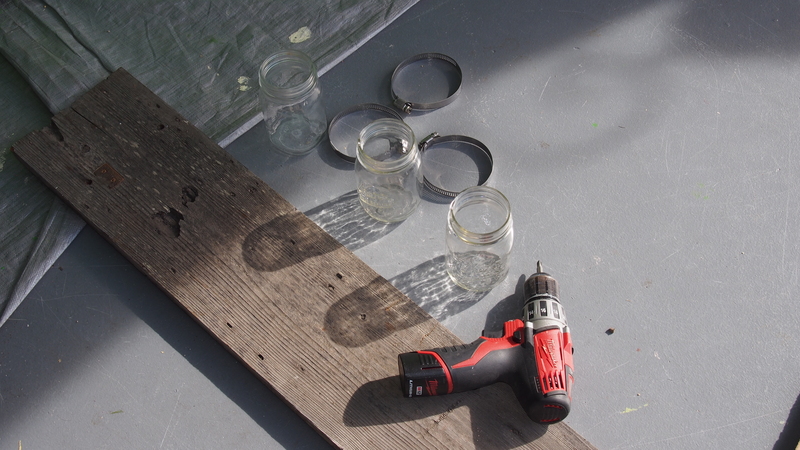 Now do this three more times- measure out how far apart you want them on your board…(be sure to make even length from top of board) and then twist in jar into clamp- use screwdriver to make secure and tight…voila! As you can see the possibilities are endless- from holding toothbrushes and cotton balls to flowers or even herbs or pens in your office- ready to get organized? ?